The header picture is a taken from a recently acquired painting by the artist, Nancy Rayner [1827-1855, Further information about Nancy and her very talented family is available on the Dudley Mail Website], titled: Study from the Drawing room, Parlington . 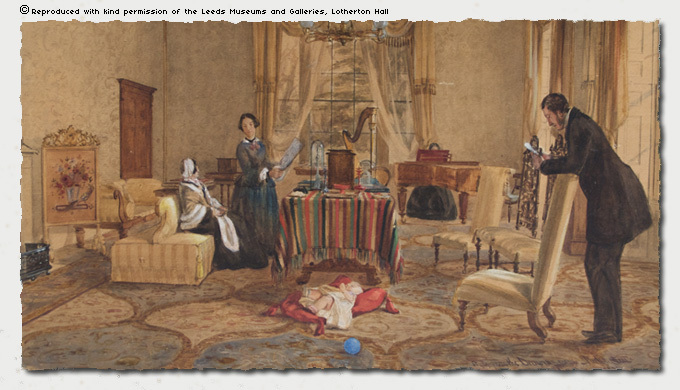 View larger picture [Taken prior to the restoration of the painting after it was acquired by Leeds City Council] The picture is used with the permission of Leeds Museum & Galleries, Lotherton Hall. The painting was discovered as a result of a reader finding the Parlington web site and has been purchased by Leeds City Council and after restoration it will be on display at Lotherton Hall. Perhaps the unknown lady was the widow of the Rev Hans Hamilton? She was staying at Parlington and her death notice appeared in the Leeds Mercury on June 6th 1857, some five years later than the date of the painting. She was the aunt of Isabella and Elizabeth, a sister of their father, Richard Oliver-Gascoigne [1762-1843]. The notice reads: On the 23rd ult., [23rd May 1857] at Parlington Hall, the residence of her niece, Mrs. Trench Gascoigne, aged 83, Mrs Hans Hamilton of Bertie Terrace, Leamington, relict of the late Rev. Hans Hamilton, D.D. and daughter of the late Right Hon. Silver Oliver, of Castle Oliver, in the County of Limerick. Her name was Susanna, if the citation in the peerage.com is correct. Hans Hamilton was the son of Rt. Rev. Hugh Hamilton and Isabella Wood. He married Susanna Oliver, daughter of Rt. Hon. Silver Oliver and Isabella Sarah Newman. He died in 1839, without issue. He was the Rector at Kilmoganny, County Kilkenny, Ireland. He graduated with a Doctor of Divinity (D.D.). He was the Rector at Knocktopher, County Kilkenny, Ireland. He held the office of Prebendary of Kilmanagh. The words of the Rev F.S. Colman, from 1908 about the efforts of Captain Gascoigne in the endeavour to rescue General Gordon at Khartoum reflect very obviously a certain deference to matters of national pride, you can almost sense the Union Flags waving in response to a call to arms, for whatever reason this patriotism is seen only rarely these days, not since the Fauklands conflict I would argue. Later again as a Captain, but this time with the Yorkshire Hussar Squadron, which formed No. 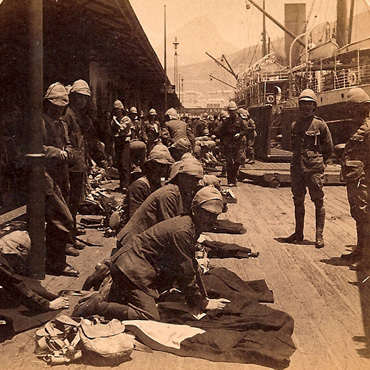 9 Company of the 3rd Imperial Yeomanry, he went to serve in the Boer War in February 1900. Subsequently taking command of the regiment until its return to England, and was then gazetted to the command of the Yorkshire Hussars. For his services in the Boer War he received the medal with four clasps and was awarded the Companionship of the Distinguished Service Order. An Excursion, following publishing of the above Picture. The article on the Pockington site by Ian Gibbs highlights the interest of George Reed in motorcycles, this mirrors a similar fascination for Richard Gascoigne but his penchant was for the more expensive motor car. Indeed a tale relayed to me by the former chauffeur to the Gascoigne Family, Bill Burlingham described how in his later years the Colonal driving a large V8 Ford Pilot managed to run off the main driveway up towards the Triumphal Arch and hit one of the beech trees that line the road! 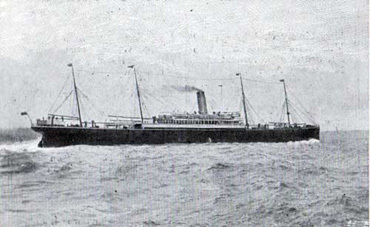 A further note of interest; the SS Winifredian was torpedoed mined on 17th April 1917 off coast of Northern Scotland, north by east of Noss Head north coast of Donegal, by U Boat UC76 commanded by, Wilhelm Barten, although seemingly not sunk. 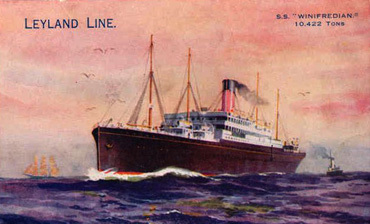 Further details are to be found on www.uboat.net towards the bottom of the page. What happened to her after that I do not know! However one thing is worth noting, the colonel as of 1917 was active in a number of ways in assisting the war effort, not least the conversion of Lotherton Hall to form a hospital for wounded troops. You can almost see him sitting in the study reading the Times, and spilling his tea as he read of the torpedoing of the SS Winifredian, his old troop ship from the Boer War! I would bargain he might have said, Damn the Hun! or Bloody Germans! or something along those lines. Returning to the Gascoigne Theme! In an earlier paragraph I alluded to the life style choice made by Richard Gascoigne, I made the point because to me it seems that he was able to embark on his military career, in part because his forebears had done much to provide a substantial wealth on the back of the estates, but more in particular on the strength of the Gascoigne mines. He was to some extent like the absent landlords so decried in Ireland in the early nineteenth century, a position which his mother, Isabella was set against along with her sister, Elizabeth. They strived to do their utmost to help the deteriorating position in Ireland in the 1840's. The position was clear by the time, Richard was in full sway over the Gascoigne estate, some 15 years after his father's death, in 1919 he decided to sell out, and the three pits, valued at £100,000.00 were purchased by a limited company controlled by Wharncliffe Silkstone of Tankersley near Barnsley. The pattern of distancing oneself from the routes of family wealth, but living from the proceeds, is a very common thread in British society after the early pioneers in the industrial age. Richard Oliver Gascoigne, turned a small colliery into a thriving business, his successor through marriage, Frederick, applied more of the same as his mantra, but lacked the imagination of his wife's father, only applying that which was necessary, such as the first steam engines in 1870. But the real innovation was in building the tracked infrastructure in the 1830's. After the death of Richard in 1937, the Gascoigne heir, Alvery was already established in what might be considered as the next phase of British cultural transformation, the Civil Service! In the years following the death of Colonel Frederick Gascoigne in 1905, although Parlington was largely unused, it was still in use by servants or employees of the family in the west wing, Richard allowed the estate and the Hall to be used for a variety of events, also see the introduction page to the Hall. During the First World War, Lotherton was utilised as an infirmary for the wounded, indeed Cynthia, Richard's daughter was a nurse. Richard and his wife Gwendolen did much to turn Lotherton into a fine family home, lavishing considerable time and money on the house and gardens, it is said that they chose to live at Lotherton over Parlington because of the prevailing damp conditions to be found in the old hall, the dampness is still evident! Perhaps the truth lies in the simple fact that they were able to take advantage of lotherton only a year after marrying, when Richard inherited the Lotherton estates from his aunt Elizabeth, who died without an heir. Lotherton afforded them the opportunity to spend their money on equiping the house with central heating and electricity alongside making alterations to the house in general. To have moved back to Parlington after 1905, would not have been a consideration. Richard and his family were the first of the Gascoignes to live at Lotherton, the estate had been purchased by Richard Oliver Gascoigne [ROG] in 1825, possibly for his daughters as the expected lineage would have passed through his eldest and then second son, but following their untimely deaths in 1842, it passed to his daughter Elizabeth after he died in 1843, but she did not live there, choosing instead to live at Parlington until her marriage to Baron Ashtown. The Gascoigne Family is not the focus of this site, therefore the family aspects are considered only during the time that they lived at Parlington and just after, more recent history concerning the family is available at Lotherton Hall.